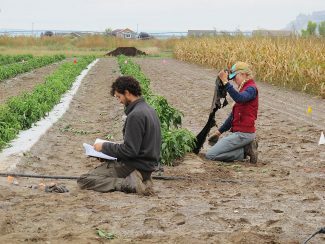 Earlier this fall, graduate students Ben Samuelson and Elise Reid work on removing biomulch, sensors, and other apparatus from the plot where the fabric mulch is being tested at Scottsbluff, Neb. The peppers were harvested weeks ago from a small research plot at the Panhandle Research and Extension Center, Scottsbluff, Neb., where a type of fabric mulch is being tested for potential use in U.S. Department of Agriculture certified organic produce fields. During the off-season, researchers are checking to see what becomes of the biodegradable mulch, an experimental product from 3M that is being tested to see if it is suitable for USDA-certified organic vegetable production. Last spring, six rows of peppers were planted through 3-foot-wide strips of mulch. Two different types of mulch, one black and the other white, are being tested. Recently, workers were busy in the plot setting up six different treatment regimens for the harvested plots, to see if the fabric mulch will disintegrate differently under different conditions. The crew, consisting of graduate students Ben Samuelson and Elise Reid, along with technician Tom Galusha and Extension Educator Gary Stone, dismantled the plants, trellises, and data collection sensors that were in place during the 2017 growing season. This is the first year of a three-year trial. The research is concerned primarily with what happens to the mulch after the growing season, according to Samuelson. How long does it take to degrade and become part of the soil? Can growers do things to the field to affect that process, such as tillage, adding compost, or growing cover crops? Applying compost over the fabric. At the Scottsbluff site, the compost comes from a feedlot and consists mostly of manure, vegetative materials from trees, corn stovers and similar material. Applying a compost extract. The extract starts with an earthworm compost (with potentially beneficial microbes) suspended in water. The microbes include fungal strands, spores, nematodes, protozoa and similar life forms beneficial to topsoil, Samuelson said. It is hoped that they will benefit the soil, even a small amount diluted in water. Fallow irrigation. Soil moisture will be tested regularly and irrigation water applied when the moisture falls below a certain threshold. Cover crops, planted in the spring. Mustard and/or clover are the cover crops under consideration, to be planted as soon as possible after spring thaw. A combination of all four of the treatments above. A control treatment, consisting of no action. Over coming months, data will be collected to determine how much of the mulch has degraded to organic materials and how the soil is changing. Next year, another, different, crop will be planted in the plot. Biodegradable mulch is made from polylactic acid (PLA), derived from corn, not petroleum. The project is funded by the USDA National Institute of Food and Agriculture Organic Transitions Program.